This page is done using SPSS 19. For the purpose of illustration, we have simulated a data set for Example 3 above: https://stats.idre.ucla.edu/wp-content/uploads/2016/02/poisson_sim.sav. In this example, num_awards is the outcome variable and indicates the number of awards earned by students at a high school in a year, math is a continuous predictor variable and represents students’ scores on their math final exam, and prog is a categorical predictor variable with three levels indicating the type of program in which the students were enrolled. /STATISTICS=MEAN STDDEV VAR MIN MAX . Each variable has 200 valid observations and their distributions seem quite reasonable. The unconditional mean and variance of our outcome variable are not extremely different. Our model assumes that these values, conditioned on the predictor variables, will be equal (or at least roughly so). Let’s continue with our description of the variables in this dataset. The table below shows the average numbers of awards by program type and seems to suggest that program type is a good candidate for predicting the number of awards, our outcome variable, because the mean value of the outcome appears to vary by prog. Additionally, the means and variances within each level of prog–the conditional means and variances–are similar. MEANS tables = num_awards by prog. Poisson regression – Poisson regression is often used for modeling count data. It has a number of extensions useful for count models. Negative binomial regression – Negative binomial regression can be used for over-dispersed count data, that is when the conditional variance exceeds the conditional mean. It can be considered as a generalization of Poisson regression since it has the same mean structure as Poisson regression and it has an extra parameter to model the over-dispersion. If the conditional distribution of the outcome variable is over-dispersed, the confidence intervals for Negative binomial regression are likely to be narrower as compared to those from a Poisson regession. Below we use the genlin command to estimate a Poisson regression model. We have one continuous predictor and one categorical predictor. In the genlin line, we list our categorical predictor prog after "by" and our continuous predictor math after "with". Both appear in the model line. We use the covb=robust option in the criteria line to obtain robust standard errors for the parameter estimates as recommended by Cameron and Trivedi (2009) to control for mild violation of the distribution assumption that the variance equals the mean. Finally, we ask SPSS to print out the model fit statistics, the summary of the model effects, and the parameter estimates. The output begins with the Goodness of Fit table. 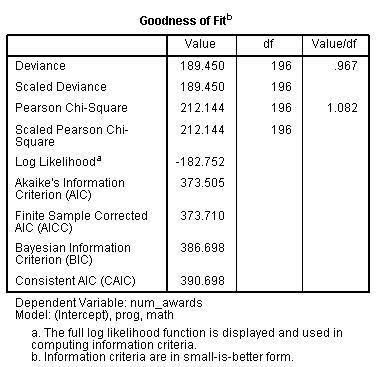 This lists various statistics indicating model fit. 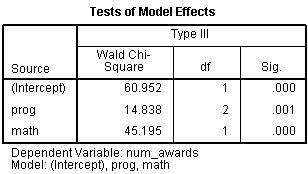 To assess the fit of the model, the goodness-of-fit chi-squared test is provided in the first line of this table. We evaluate the deviance (189.45) as Chi-square distributed with the model degrees of freedom (196). This is not a test of the model coefficients (which we saw in the header information), but a test of the model form: Does the poisson model form fit our data? We conclude that the model fits reasonably well because the goodness-of-fit chi-squared test is not statistically significant (with 196 degrees of freedom, p = 0.204). If the test had been statistically significant, it would indicate that the data do not fit the model well. In that situation, we may try to determine if there are omitted predictor variables, if our linearity assumption holds and/or if there is an issue of over-dispersion. Next we see the Omnibus Test. This is a test that all of the estimated coefficients are equal to zero–a test of the model as a whole. From the p-value, we can see that the model is statistically significant. Next is the Tests of Model Effects. This evaluates each of the model variables with the appropriate degrees of freedom. The prog variable is categorical with three levels. Thus, it will appear in the model as two one degree-of-freedom indicator variables. 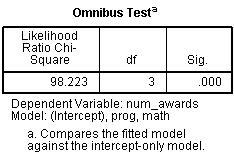 To assess the significance of prog as a variable, we need to test these two dummy variables together in a two degree-of-freedom chi-square test. 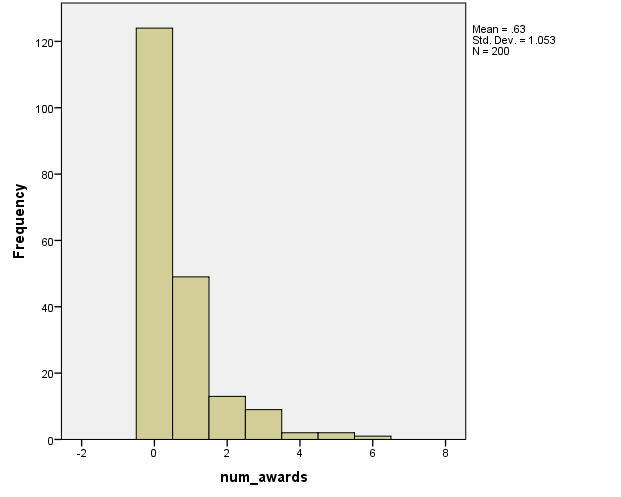 This indicates that prog is a statistically significant predictor of num_awards. The continuous predictor variable math requires one degree-of-freedom in the model, and so the test presented here is equivalent to that in the Parameter Estimates output. Next, we see the Parameter Estimates. This includes the regression coefficients for each of the variables along with robust standard errors, p-values and 95% confidence intervals for the coefficients. The coefficient for math is 0.07. This means that the expected increase in log count for a one-unit increase in math is .07. The indicator variable [prog=1] is the expected difference in log count between group 1 and the reference group [prog=3]. Compared to level 3 of prog, the expected log count for level 1 of prog decreases by about 0.37. The indicator variable [prog=2] is the expected difference in log count between group 2 and the reference group. Compared to level 3 of prog, the expected log count for level 2 of prog increases by about .71. We saw from the Tests of Model Effects output that prog, overall, is statistically significant. Sometimes, we might want to present the regression results as incident rate ratios. These IRR values are equal to our coefficients from the output above exponentiated and we can ask SPSS to print solution(exponentiated). The output above indicates that the incident rate for [prog=2] is 2.042 times the incident rate for the reference group, [prog=3]. Likewise, the incident rate for [prog=1] is 0.691 times the incident rate for the reference group holding the other variables at constant. The percent change in the incident rate of num_awards is an increase of 7% for every unit increase in math. log(num_awards) = Intercept + b1(prog=1) + b2(prog=2) + b3math. To understand the model better, we can use the emmeans command to calculate the predicted counts at each level of prog, holding all other variables (in this example, math) in the model at their means. In the output above, we see that the predicted number of events for level 1 of prog is about .21, holding math at its mean. The predicted number of events for level 2 of prog is higher at .62, and the predicted number of events for level 3 of prog is about .31. Note that the predicted count of level 2 of prog is (.62/.31) = 2.0 times higher than the predicted count for level 3 of prog. This matches what we saw in the IRR output table. Below we will obtain the predicted counts for each value of prog at two set values of math: 35 and 75. /EMMEANS TABLES=prog CONTROL =math(35) SCALE=ORIGINAL. /EMMEANS TABLES=prog CONTROL =math(75) SCALE=ORIGINAL. The table above shows that with prog=1 and math held at 35, the average predicted count (or average number of awards) is about .06; when math = 75, the average predicted count for prog=1 is about 1.01. If we look at these predicted counts at math = 35 and math = 75, we can see that the ratio is (1.01/0.06) = 16.8. This matches (within rounding error) the IRR of 1.0727 for a 40 unit change: 1.0727^40 = 16.1. Assuming that the model is correctly specified, you may want to check for overdispersion. There are several tests including the likelihood ratio test of over-dispersion parameter alpha by running the same regression model using negative binomial distribution (distribution = negbin). The outcome variable in a Poisson regression cannot have negative numbers.